It has being to long since I did a review here on the Blog. I miss y’all! I hope you have read wonderful books in my absence and that they filled your days with great adventures. I will love to hear all about it. So please leave your comments below. Today I will bring another good book to your To Read List. its a Hex Hall Novel-If you do not know about it here is the link to the Review on this blog about it: Hex Hall Series Review -that I had the pleasure of reading about 2 years ago. At first I was very exited by this since I did read the Hex Hall Series (3 books not counting this one) and was in love with it. If you are one of the readers who has read The Hex Hall series and you are expecting -like me- to have another book in the series. Then I am here to tell you that it’s not what you are going to get at all. I was sorry that this was the case. I was looking forward to having another book relating the adventures of Sophie and how all came together for her after all they when trough. This book how ever is from a totally different perspective and with characters that we know, just not as much in dept. Izzy is one of the Brannicks. Sophie’s cousin on her mother side and this is completely from her perspective. Her life, what she sees and how she sees it. For me it was another great work from Rachel Hawkins. Even tough it was not what I expected, the little of disappointment I had over was way over weighed by this new trilling story. Even tough it touches a bit on the same subject and some of the same principles as Hex Hall- Girl is in school, girl makes friends in a new school, etc.- she made it in a way that was not boring on the same as every other book. I loved that she kept writing in a way that made me want more and more. Information is feed to the reader in a calculated manner. Trusting you with bits and pieces of the story, but never the whole. Not at the same time and not till the end anyways. I never saw the end coming. The little details is what matter to me, and this one meet all my Must Haves list. Passing with flying colors. I wish there was a second one to this line of her writing already out there in the market for me to buy ASAP. The book certainly has a lot more to be told, if there would be a second book after this one, and this would be made another series I would not be surprised at all. There is still a lot to discover that was not uncovered so far, and this has me all exited. Maybe there would be more… I sure Hope so! As Always I hope y’all enjoy. 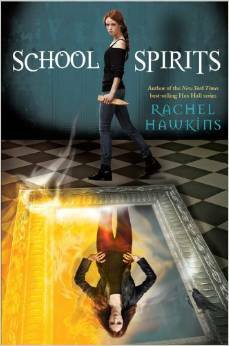 Posted on April 21, 2015 by ccalvarez90Posted in UncategorizedTagged #goodbooks, #GreatAuthor, #greatseries, #igeekbooksreview, #RachelHawkins. Next Next post: Review of The Collector By Nora Roberts. Spoiler Alert.